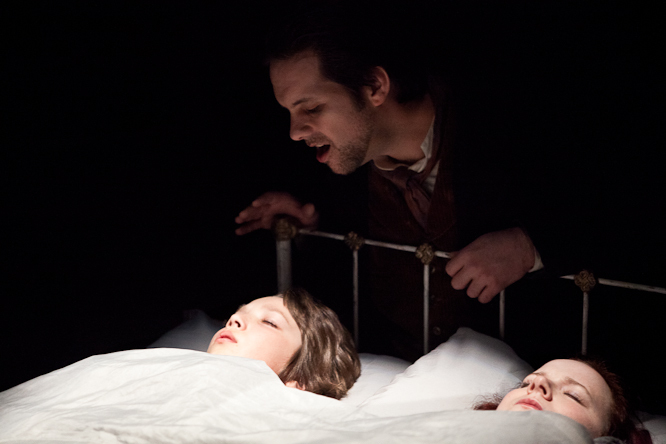 The kids aren’t alright in Against the Grain Theatre’s production of the Turn of the Screw, an opera adapted in 1954 from the 1898 novella by Henry James. This gothic opera tells a ghost story about a governess whose two charges, a little boy named Miles and a little girl named Flora, apparently start seeing the ghosts of their former governess, Miss Jessel, and the caretaker who seduced her, Peter Quint. However, as much as the audience can see the ghosts lurking around the children, we’re left wondering if perhaps the governess is imagining the otherworldly creatures, as the children often deny seeing them. One of the main themes explored in this production is innocence and the corruption of the innocent, which is mostly seen with Miles who is kicked out of school and thought to have been corrupted by Peter Quint, a vague assertion that can mean any number of things. Taking place at the Helen Gardiner Phelan Playhouse, this opera finds the perfect space to showcase such a classically haunting tale. On the second floor, the space is very intimate and very unique to anything else I’d experienced before. The “stage” is more like a runway, with the audience flanking either side of it. With the entrance and exit to the stage/runway being on each end, it provided the actors with an interesting method of coming on and off stage. With such a different stage to perform on, I worried that certain actors might not be visible to all audience members because if they faced one side of the audience to sing, their backs would automatically be to the opposite side of the audience. I couldn’t have been more wrong. The actors did an incredible job of rotating their bodies in a natural manner so that each audience member was able to see the small expressions on their faces and subtle movements. The actors all did a fantastic job of performing each piece and I was especially impressed by Sebastian Gayowsky, the young man who played Miles. The only child in the play, this eighth grader certainly kept up with the impressive roster of opera singers who were in the production. I have to give credit to Miss Jessel, played by Betty Allison, for being such a creepy ghost and using her eyes to glance around in the most sinister way possible! My date and I were equally impressed by the use of lighting and smoke to create an eerie ambiance in the space. Lights were projected to create creepy shadows while the smoke made the atmosphere feel even more haunted, especially in the notably creepier second half of the show where the audience gets to experience more of the ghosts. The Turn of the Screw is only playing until May 27, so if you’re a fan of the original opera or love the novella, you’ll definitely enjoy this production. In such an intimate venue, you’ll appreciate being so close to the actors that you can almost touch them!